Marvel is helping fans pass the time before Guardians of the Galaxy hits theaters this weekend by releasing a new featurette that focuses on Dave Bautista's Drax the Destroyer, following yesterday's video that offered more details about Rocket Raccoon (Bradley Cooper) and Groot (Vin Diesel). 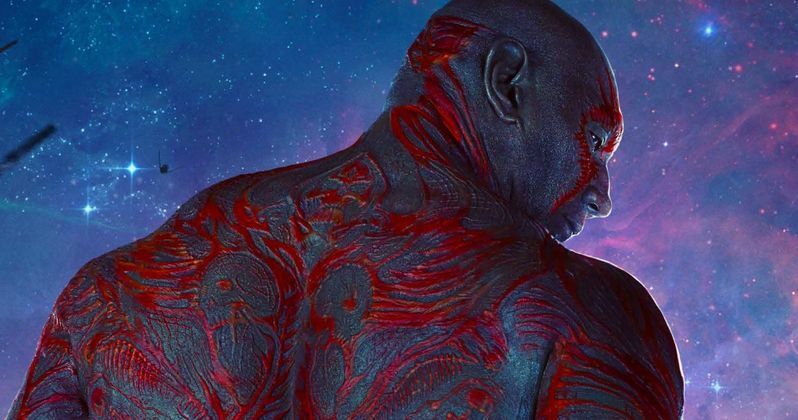 WWE Superstar turned actor Dave Bautista explains that Drax has been living solely for revenge, as it becomes clear that he will do whatever it takes to avenge the death of his family, at the hands of Ronan the Accuser. From Marvel, the studio that brought you the global blockbuster franchises of Iron Man, Thor, Captain America and The Avengers, comes a new team-the Guardians of the Galaxy. An action-packed, epic space adventure, Marvel's Guardians of the Galaxy expands the Marvel Cinematic Universe into the cosmos, where brash adventurer Peter Quill finds himself the object of an unrelenting bounty hunt after stealing a mysterious orb coveted by Ronan, a powerful villain with ambitions that threaten the entire universe.